The boiler rooms of Annex, Middle School and High School have been fully renovated in the summer of 2016. The boiler rooms were old and their condition was poor. The installation layout was chaotic and wear and tear were evident everywhere. Basic infrastructures were also missing. New boiler rooms have taken into consideration modern and updated techniques and technologies, energy saving tools and building regulations to meet the higher standards of a natural gas driven boiler room (for future reference). Most importantly, the whole renovation has been designed in such a way that the boiler rooms can shift to natural gas driving without any loss of the present renovation items or components. Complete renovation of building elements; the floor has been restructured to provide incline for water draining, walls have been rearranged according to regulations and standards for natural gas future retrofit. New boilers have been installed, new piping, new pumps, new valves, and new auxiliary components; all of them in a well shaped and organized layout. Automation and energy saving systems have been installed. New inverter circulating pumps have been installed, made in Germany. Inverter achieves energy saving and is capable to match the circulator in the most suitable power that the installation demands. Modern compensation three way valve and suitable controllers have been installed, performing continuous monitoring of the environment temperature and the heating needs, automatically matching the boiler operation to the minimum level. The result is less boiler operation time and less energy consumption. New Siemens automation systems, equipped with suitable sensors, have been installed to boiler rooms, offering the possibility of monitoring, recording and remote controlling of boiler rooms. During the summer, 20 small WCs of ACS Athens campus have been completely renovated and turned to pleasant, modern and practical rest rooms. Old installations and fixtures have been completely removed and new ones have been installed in place. All sewage pipes have been replaced. Special care has been given to the selection of pipes that are sound proof in order to minimize the noise of flushing water. All main water supply pipes have been replaced and arranged in such a way as to facilitate future maintenance. All electrical wiring has been replaced. Moreover, new electrical switchboards have been installed to accommodate the loads of the WC. New tiles on the floor and walls have been installed. On the floor, we selected slightly anti-slip tiles for safety reasons. The ceiling has been replaced with modern ceiling plates. All sanitary articles have been renovated. In addition, necessary accessories have been added, depending on the users of the rest room. The lighting has been replaced with modern led fixtures. The doors and windows have been maintained or renewed were necessary. Special design (edge-free) heating radiators with automatic temperature-control valves have been selected for the designated areas. Ventilation facilities have been installed where necessary. The tennis area has been completely reconstructed. The new design oers four tennis courts and a big playground area for children. The tennis posts are portable and can be moved aside providing the children with a wide and safe area during their break. The new tennis courts are made of turf (artificial grass) in blue and green colors. After reconstruction, we can provide four courts, two singles and two doubles, all located in a unified area. The turf, that has been used, is approved by the International Tennis Federation. In addition, extra lighting poles have been installed for the better lighting of the courts. The soccer field has been fully renovated. The old turf has been removed and the ground has been surfaced by asphalt to provide a long lasting supporting layer to the new turf. The slight inclination (0.5%) of the groundwork, along with a large draining system, ensures a quick runo of the raining water. 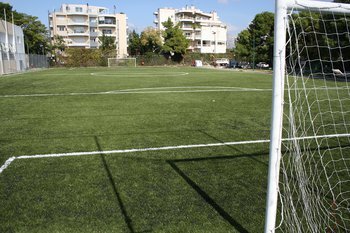 The final surface is an artificial turf, filled with sand and rubber particles, providing a safe playing area as per Hellenic Athletic Federation standards. Along with the soccer field, a new running track has been constructed, according to the standards of Hellenic Athletic Federation. A thick asphaltic layer has been primarily constructed to oer a good foundation to the track, followed by a rubber layer of 10mm and a final finishing layer of embedded rubber granules. In addition, a long jump facility, including runway and landing pit, is under construction, providing the athletic department with a new activity field. 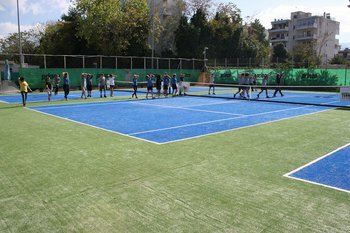 Moreover, an area of over 400 sq.m has been resurfaced in the same way as the running track, providing the athletic departments of ACS Athens with a safe multipurpose playground area. A LED board, donated by PTO, has been installed onto the main yard of ACS Athens, for making announcements or informing the parents and students of upcoming special events or activities of the school. At this point, ACS Athens would like to thank the PTO for its generous and consistent contribution to the improvement and upgrading of ACS Athens every year. In addition to the projects listed above, numerous repairs have been also carried out by the maintenance crew - excluding the ones requested by the teachers.